So I sit here writing this post, drinking my green drink (detoxing from a weekend of eating) and reflecting on the weekend that just past. 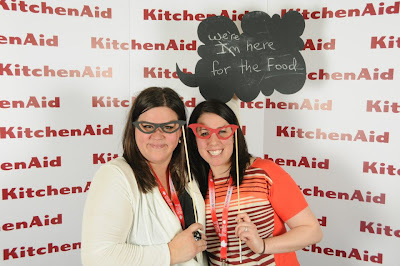 It was the first Food Bloggers of Canada conference (FBC2013) at Hockley Valley. When I first heard about the conference I knew I immediately wanted to go. 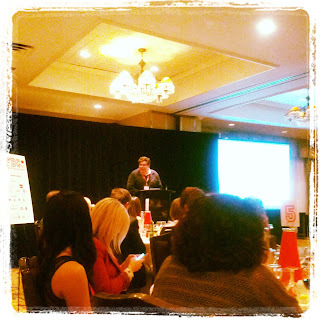 I had attended Blissdom Canada last year and didn't quite get out of it what I wanted or felt I should have. A conference specific to food blogging though would be able to give me the information and support I was looking for. The crazy thing is I almost didn't make it. When the conference dates were announced I was pregnant and figured out my little one would be just about 5 months old. At that time I was like I can leave her no problem. Fast forward several months to the date tickets were going on sale and my hand shook when trying to hit the send button. I hesitated for a second and the conference only tickets were gone. UGH! I had so much regret and got myself on the wait list right away. A few weeks before the conference I got an email from Melissa saying there were opening up a ticket for me. PHEW! I was ex-tactic I went online and bought my ticket right away. I really can't tell you how happy I am they opened up a ticket for me. I had an incredible weekend. 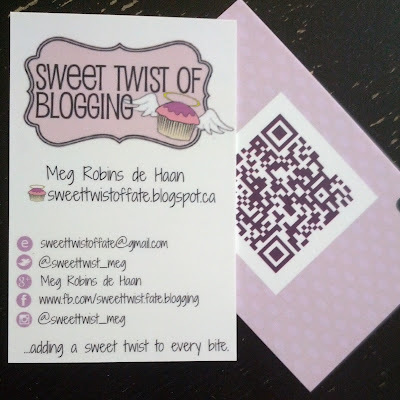 my new business cards, love them! To me there are three main highlights of the conference. 1) The Food. There were pretty high expectations for a Food Bloggers conference. Would you want to be that Chef? 75 people who will all blog about this experience and have the potential to criticize. There was no criticism here. Over the course of the weekend we ate a lot of great food. Canadian prime rib, poutine, prosciutto wrapped turkey, milkshakes, beautiful cookies (Thanks to Sweetopia), treats from Tree of Life and more. Accompanied with this food was ALOT of fabulous wines care of Wine Country Ontario. I am now in detox. 2) The Information. There were so many points over the course of Saturday and Sunday, where I felt inspired and excited. I sat there frantically trying to right down as much as I can, crossing my fingers the key points are still sitting on twitter under #FBC2013. The speakers and panelists of the weekend were so knowledge, helpful and moving. They gave us real life experiences and advice on topics like recipe development, publishing, writing, photography and working with brands to name a few. On top of all this information, David Leite, Dianne Jacobs and Dana McCauley all offered inspirational messages on how to be a better food blogger, writer and Canadian. It was a four star line up. 3) Above all, the People. This conference was amazing because of the bloggers, sponsors and three creative and hard working organizers, Mardi, Melissa and Ethan and their team of volunteers. This conference ran like a fine oiled machine. If time went over, nobody cared, everyone was too interested, involved and asking questions. Poor Alison from the Cookbook Shop had to moderate all of us and keep us on time. Frankly an impossible task when everyone wanted to chat and discuss the latest panel session. I met a lot of great people this weekend, mostly thanks to my new friend Jenny, the Brunette Baker who introduced me to them. I wish I had her spirited, fun, outgoing personality, she is so delightful. The members of FBC are an inspirational bunch of people, all ready to support, motivate and drive each other to success. I am so proud to be apart of it. "Your readers should be able to feel your emotions. That's how they connect with you." "Be authentic, be ethical, have a point of view, never be afraid to fail"
I left that conference revved up and ready to be a better writer, blogger and photographer. It truly was a weekend I will never forget. I missed meeting you, Meg, but love your pic and your favourite quotes! Canadian Bloggers have so much to offer and I am happy to meet you now! You are right about that. I will be sure to check your blog as well. Meg I was SO pleased that you were able to attend and that it met all your expectations :) Blog on! Meg, it sounds like you had a wonderful time, met fantastic people and most importantly, you walked away with so much knowledge! I'm going to my first conference soon and I hope it is for me what this conference was for you! Hopefully you will be there next time! Meg, glad you found my words worthwhile - I enjoyed meeting you very much! Sounds like you had a great time. Love the two quotes at the end. Great advice.